Here is a great personalized gift that you can do yourself! This project was featured in a Better Homes and Gardens magazine, and it is definitely on of my favorite projects. Whether you choose to make it is a gift, create a stunning wall display for yourself or just make one to adorn a tabletop - these will be everlasting displays that will warm the heart. 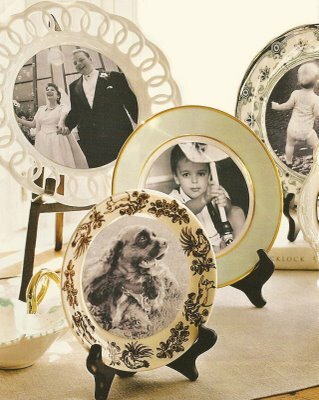 #1 Pick out a plate and print off an image large enough to fit in the center of the plate. #2 Using a compass, trace a circle around the image, the same size as the center of the plate. #3 Cut out the photo following the line of the circle. Stay just inside the pencil line to avoid seeing pencil marks on your photo. #4 Using double-sided tape adhere the photo to the plate. Or you can print the photo onto Post-It self-adhesive photo paper. It's that easy! Have fun and be creative with your plates! If you do happen to try this project feel free to email us your work, we may just profile it here on our blog!